Although there have been a couple of leaks on Rome's performance, AMD's newest server CPU has never been put head to head against Intel's immediate competition, the new Cascade Lake based Xeon server CPU. 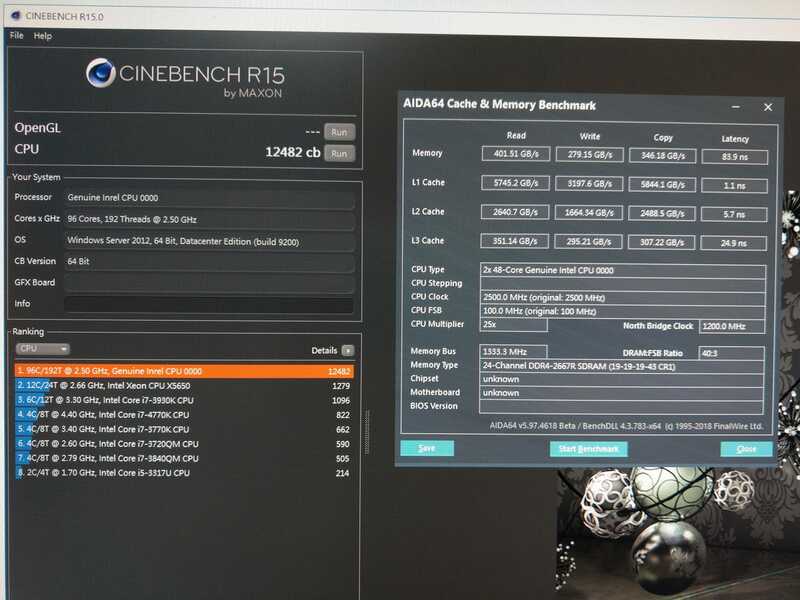 However, Wang Dang of HKEPC has apparently gotten access to a Cascade Lake based system and reported the Cinebench score is achieved. Update: A reader has informed us that there is a spelling mistake in the name of the "Genuine Intel CPU" on the Cinebench R15, where the program incorrectly says "Inrel" and not "Intel." Meanwhile, the AIDA64 benchmark window correctly says "Intel." In light of this contradiction, we would advise readers to treat this leak with a high amount of skepticism as Cinebench scores are notorious for being easily faked. Also, some publications are reporting that the benchmark image of the Rome machine scoring 12861 points is also from HKEPC but it's actually an uncropped version of the image Chiphell leaked in October. Where this Rome score came from is uncertain. With both AMD's Rome and Intel's Cascade Lake architectures slated to come to market in 2019, it's not surprising that official performance numbers have mostly been kept under wraps. Of course, there will always be leaks that tell us where the situation might be, and this is one such instance. Dang Wang of the HKEPC Facebook group has allegedly tested Intel's unreleased 48 core server CPU in a 2 socket configuration for a total of 96 cores and 192 threads. 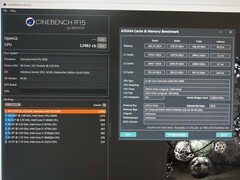 The dual socket configuration scored 12482 points in Cinebench R15, just shy of the 12861 points the alleged dual socket Rome configuration from last month scored. Assuming both of these scores are legitimate, it is interesting how both CPU configurations scored less than 1% within one another. Perhaps Cinebench can't score higher than 12000 accurately, or perhaps Cinebench can't handle as many threads as these two configurations deliver. It is also possible that the core advantage of AMD's Rome is negated by the Cascade Lake system's higher clock speed, meaning that the almost identical scores are just coincidental. However, as with all rumors, do not discount or believe these scores until they are either totally confirmed or denied by independent sources who have confirmed access to these CPUs. Rumors are fun to discuss, but they must be evaluated on their own merits and they are only rumors until confirmed or denied.